My last market conditions update was in May of last year. At that time, the market was red hot, which made me sound crazy for being more bear than bull. I couldn't explain why prices were rising so fast, and I had plenty of concerns about the downside. The market has slowed quite a bit since then. Fortunately we haven't had a bubble-burst, but today's market seems more in line with the reality of the current job/income environment, where many people are still making less money than they did 5-8 years ago. Good, clean, well-presented homes with reasonable price tags are selling within a couple-few months, while homes which show poorly and/or are overpriced linger on the market. Inventory is on the rise again, after falling to a level where there simply weren't any homes for sale in many neighborhoods last summer. 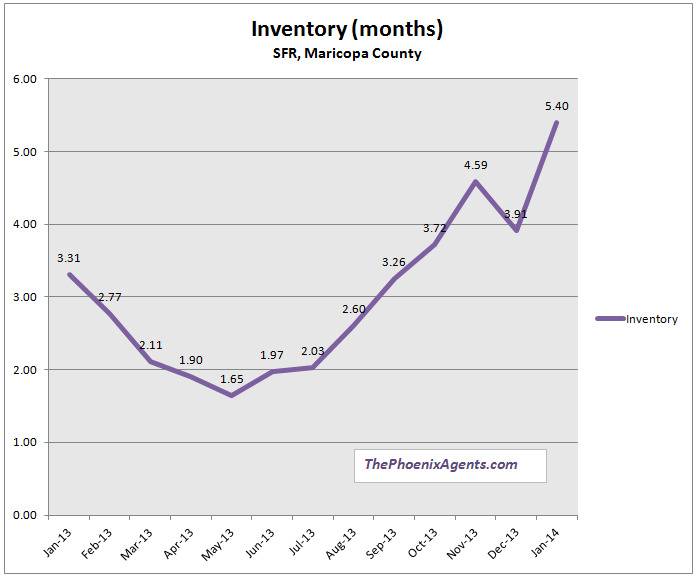 The general rule of thumb is that 4-6 months' inventory represents a balanced market. The concern here is that if inventory gets above 6 months, we'll be in a buyers' market, which means prices will start falling. 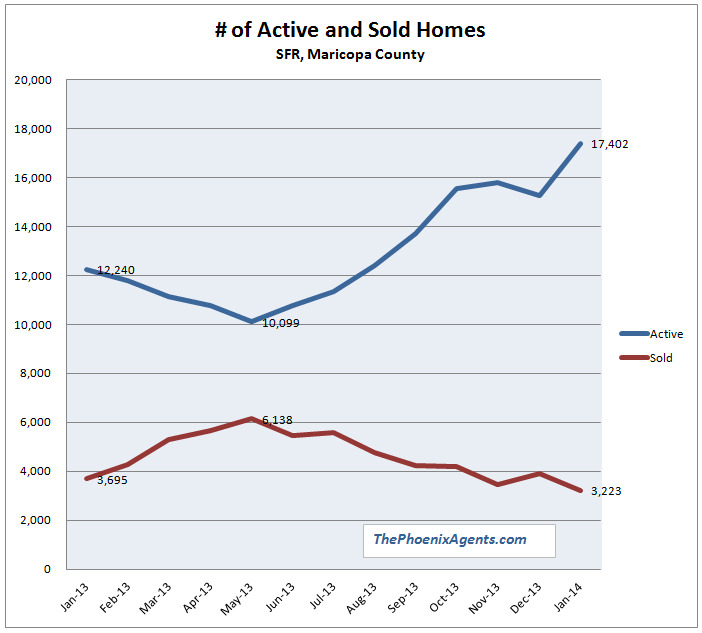 Active and Sold Homes - these are the numbers that make up the inventory. Notice last summer we had almost as many sales as active listings, but the gap between the two has grown steadily since then. And while our market is cyclical (hotter in the summers), comparing January this year to January last year shows how much we've slowed down. Each month there are more people who want to sell their homes than there are actual buyers. This is creating a lot of competition among the sellers, and giving buyers plenty of homes to choose from within their price range and neighborhoods. 1.) The large difference between the median price of Active Listings and the median price of Sold homes. This makes it pretty obvious that the lower priced homes are selling, while the higher priced homes are sitting on the market. 2.) 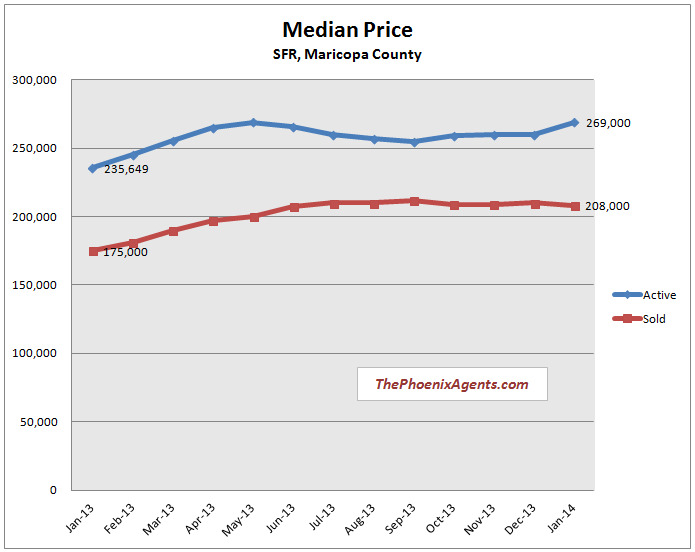 The median Sold price has leveled off over the last 6-8 months, while the Active Listings' prices continue to rise. It looks as though the sellers haven't gotten the memo that the market has slowed down. I don't think jobs and incomes are supporting the current prices; buyers are having to reach deep into their budgets to afford the neighborhoods where they feel comfortable. Interest rates are still really really really low, although they are up about 0.5% (give or take) from last May. Maybe this is part of the slowdown... But any small increase in rates could cause a dramatic decrease in demand from buyers. Mainstream media hasn't yet reported on the market slowdown. (which is normal, since they're usually 6-12 months behind the trends.) But once they do, buyers will immediately, and en masse, start dropping their asking prices significantly. Downward Spiral - once buyers believe prices are falling, there is no longer any pressure to make an offer. In fact, they'll believe waiting until prices fall even lower is the smart play. When that happens, we'll see sellers dropping prices by large amounts to incentivize an offer. Vacant Homes (anecdotal only - no charts today) - We're still seeing a large number of vacant homes on the market, which means the market is still far from being recovered. And it's hard to make a case for a strong market when we can't make the case that it has even recovered from the 2008 crater. 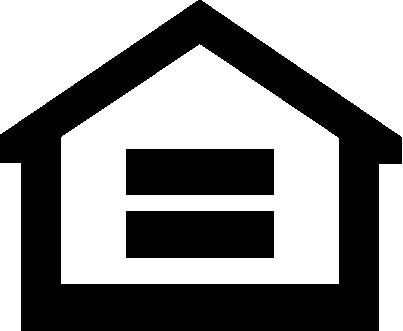 Families not moving - a couple months ago I spoke with my first family in several years who is selling one home and buying another, just because they want to make a move. (different size, different neighborhood, etc.) Almost every buyer and seller we've spoken to in the last few years has had an external reason for buying or selling - moving into/out of state, death in the family, divorce, marriage, retirement, etc. Again, these are not the signs of a healthy and recovered market. Time on our side - the longer term good news is that we're getting further away from the 2008-2010 years of record foreclosures. Many of the people who lost everything are (or will be) back on their feet, with stable employment and repaired credit. Unfortunately it can take a long time to rebuild a nest egg, and down payments aren't always small. Eventually many of these people will be buyers once again, but I don't see a tidal wave of demand coming from this population this year. Overall, the charts aren't painting an optimistic picture, but so far they aren't showing us any reason to press the panic button either. If you need to sell your house, go ahead and do so. (but please call us to help!) Just be prepared to put in some effort to make sure it looks as good as possible, because you'll have more competition than you probably want. And if you're thinking about buying, great! You can lock in today's low interest rates, and take your time looking for just the right home. Then, as long as you can comfortably make the mortgage payment and you have longer term plans, you'll be fine - even if prices do dip a little bit from here. Either way, I'd proceed, but I'd do so with caution.